Dress up your wardrobe with our mmonogrammed ladies dresses. 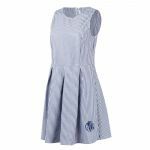 Our ladies dresses are perfect for sunny days or style it with trendy accessories. Add a blanket scarf, fun jacket and pair your new dress with adorable riding boots fora perfect fall outfit.